I don’t think those with FMS have this symptom cornered, however. It can be attributed to an inability to sleep or a response to medications for those with other chronic pain or conditions as well. But unlike the temporary fog you feel from taking an allergy medication, memory loss and disorientation are two common symptoms that plague us. Take a minute to watch this video from Chronic Illness on the Mighty describe Fibro Fog. Some of these are pretty accurate and will give you a sense of what it’s like! I appreciate reading the thoughts and stories of others who share my sometimes debilitating condition. We all have different responses and ways of coping with our chronic conditions. Here are some ways to Beat Fibro Fog. 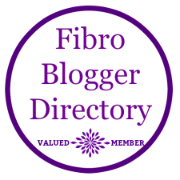 And please check out some of my fellow FibroWarriors who blog at the Fibro Blogger Directory link on my page. Do you experience Brain Fog or Fibro Fog? Do you have any strategies for dealing with it? It’s 5:24 in the morning and I was sitting here writing a post on brain fog. Chemo fog, fibro fog, pain fog and all the rest. This is almost eerie. I get fibro fog like crazy. It could be migraines, depression, stress, fibro, general pain, somatiform disorder, whatever. I’m super prone to what I know as The Doorway Effect. I walk through a doorway and forget what I’m doing, where I’m going, etc. About 10 minutes later it comes back to me. Sometimes, especially when I’m asked a question, I can only make syllables. Seriously, all that comes out of my face for probably a good 30 seconds is gibberish. Or I’ll be telling aa story, and somewhere in the middle of a sentence I completely forget what I’m talking about. I make words (and I think they might make sense), but have no recollection of them, and once I come back to earth, I start in the middle of something entirely different. For 16, I have the memory of a goldfish sometimes. I actually have to write myself a list of things I need to do when they come to me, even down to “Put on shoes. Make tea. Feed rabbits. Brush your teeth,” etc. I know the feeling! I can get distracted and lose track of time so easily too. Made my list for today so I could check things off and see what I had to do and actually got done! 3 down. 10 to go. Yikes! I never put transposing numbers together with fibro, but it makes total sense. I just had not ran across that symptom. The fog is sometimes so hard to come out of that once I am finally out of it, I try not to look back into it to search for answers. I need to do more research while I am feeling decent. Thank you for your article. Yes there are so many weird symptoms to this condition. Good luck with your research. I look forward to reading your thoughts as well!